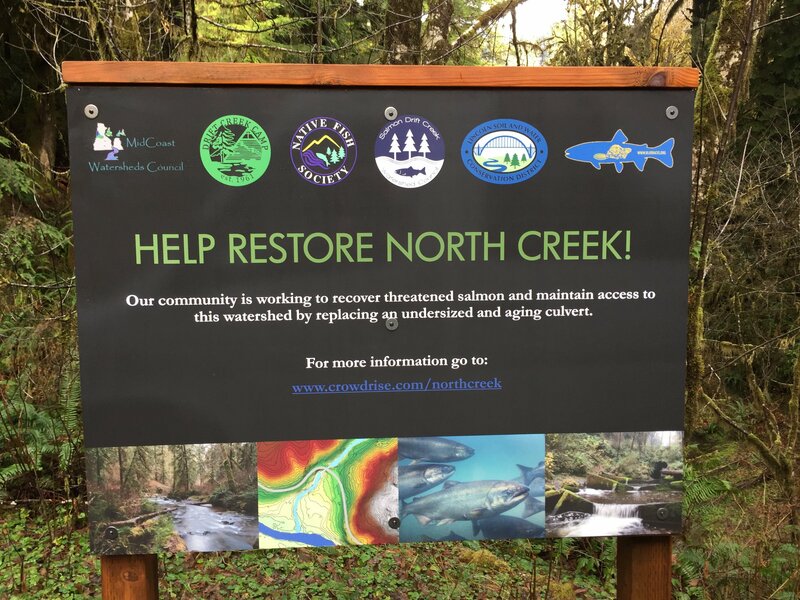 Our community is working to recover threatened salmon and maintain access to Drift Creek’s watershed by replacing the undersized culvert at North Creek. Over the years, there have been a variety of routes guests could travel to visit Drift Creek Camp. Today, a single access road remains. Several local agencies are working together to restore North Creek and replace the failing culvert which lies along that single access road with a safer, more secure structure that will not only benefit the stream’s salmon but ensure accessibility to Drift Creek Camp for generations to come. The purpose of the project is to replace the existing undersized 11 ft. culvert, a passage barrier to the upstream migration of fish and other aquatic organisms, with a wider fish passage structure. 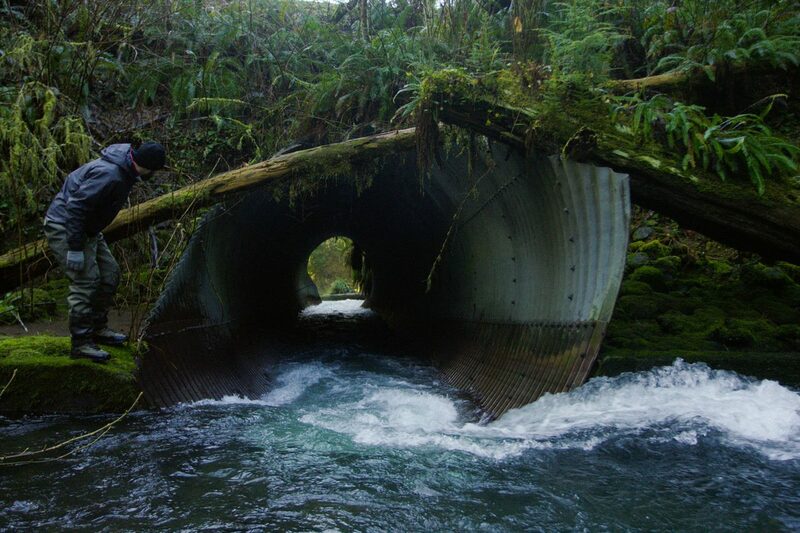 The undersized pipe will be replaced with an all aquatic organism passage structure to provide spawning and rearing habitat, and cold water refuge in summer for salmonids, including ESA Threatened Oregon Coast Coho Salmon. The new structure will function more like a bridge. It will be approximately 15 feet high and 50 feet wide. The current culvert has mitigated the salmon spawning beds. With the diameter being too small, the culvert has increased the force at which water exits. The result has been that the water has “firehosed” the receiving streambed. The gravel, needed for spawning, has been washed out. Part of the plan for replacing the culvert is to also restore the gravel, vital to the sustainability of the salmon native to Drift Creek. We recognize the necessity of this project. Not only does the current system threaten the fish population, it also poses the enormous threat of the road washing out because the culvert is too narrow to accommodate high water levels during winter storms. DCC will work with local agencies to ensure that the work is completed in a timely and efficient manner. However, the culvert intersects not only with camp’s sole access road but also with the summer program/rental season. Project details are still being determined and a contractor has not yet been appointed, however, it is highly likely that DCC will not be able to operate for several months in 2019, most likely during the summer when water levels are their lowest. The proposed closure is tentatively scheduled for June through October 2019. Unfortunately, that is the same time of year that DCC is at its peak in terms of guest usage. The season attracts visitors almost daily for outdoor schools, summer camps, family reunions and a variety of other programs. DCC depends on heavy summer rental activity to sustain operations during the slower times of the year. So while we recognize the importance of replacing the culvert, it will come with a significant income deficit. It is estimated that DCC will lose roughly $100,000 in rental income. If you would like to support DCC’s Road Recovery Fund, please send donations to PO Box 1110, Lincoln City, OR 97367.